Oh my! That zig zag jumper and floral velvet suit are divine!!!! SUch great choices! 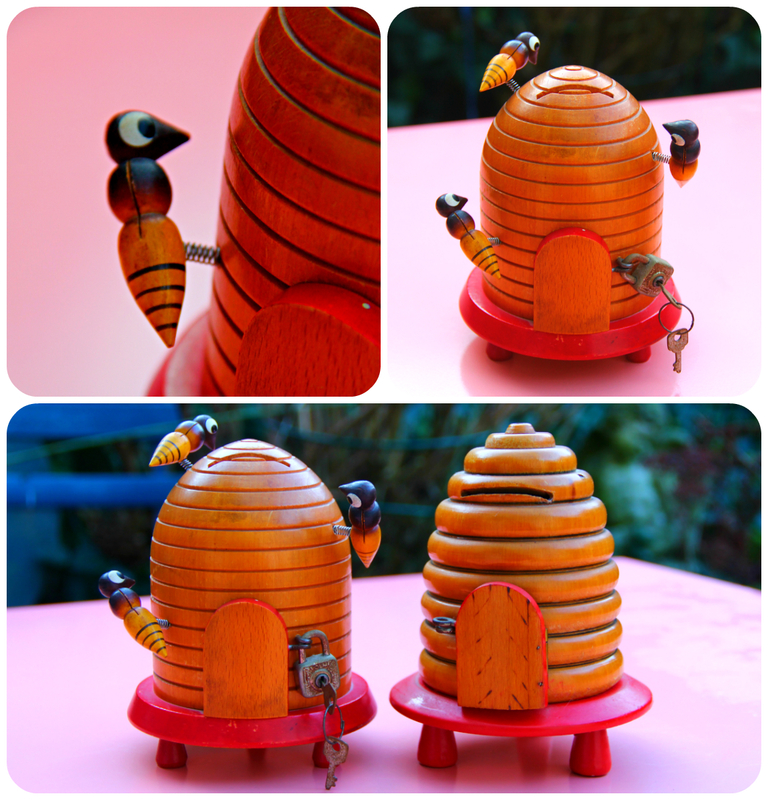 You did well at the flea market- I really like that bee hive- glad you are keeping them both! Nice book for Jan! I'd like to read that too! That floral suit is the most wonderful thing I've ever set eyes on. It was made for you! I've never seen a green celluloid brooch either-you certainly found a bargain. I actually exclaimed out loud, "OH, YES!" at the full velvet suit - what a glorious thing that is! I like getting a glimpse into your creative process - it's very similar to my closet puttering that I do on the weekends, or before I go to bed. It looks like you have a Grape Ape coat of your own! Welcome to the muppet club, ha ha! Of all your finds, that dragonfly sings to me the most. That velvet suit is possibly the most fantastic thing I've ever seen you in - and you have a lot of good clothes. It's incredible! I love the bee-bank too. Presumably honey for the industrious saver. Your celluloid brooches are so delicate. I don't think I've ever seen any out in the wild. 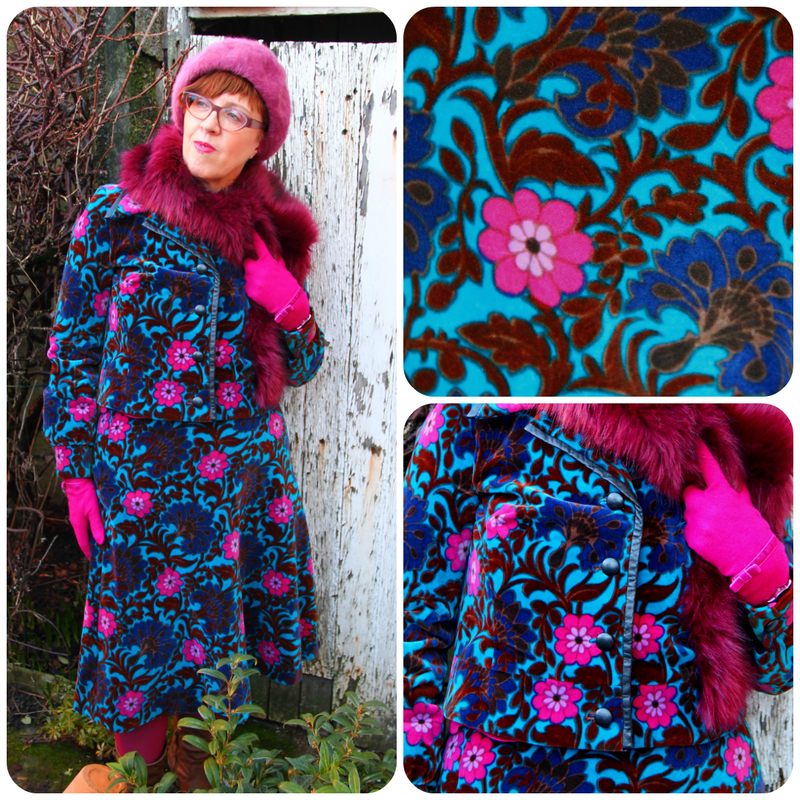 What a gorgeous velvet suit! I love the way you accessorized it. Sometimes my idea of what I'm going to wear changes in exactly the same way, I'm glad it's not just me. You always find such lovely and unusual items at flea markets, the beehives are adorable, i can see why you thought they were the same, they have many similarities. Soo,cute this beehive, is it for decoration? 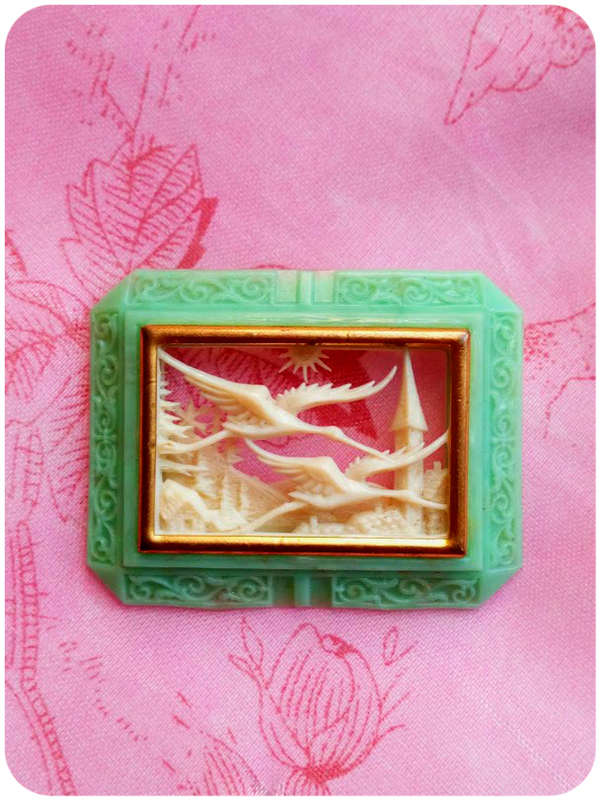 Those little celluloid brooches are like little dioramas! So detailed! I LOVE that suit all together! And the bright chevron sweater is perfect with it. That subtitle on the book is great, " Mastering The Art Of Permanent Fashion"
Unbelievable that you found two little beehives like that. I often find the same dresses when thrifting. I think I found the same bridesmaid dress over 20 times now at different stores. What a lovely outfit and the suit is beautiful. You must wear it as a suit again when the weather warms up; it won't be too long, Ann! Love pinks, purples and turquoise together - a magical combination. 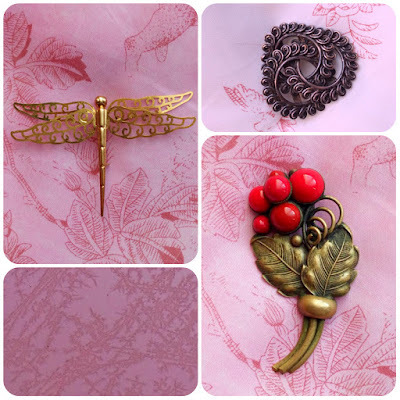 Your brooch finds (and the pendant and beehive - so cute) are fabulous. 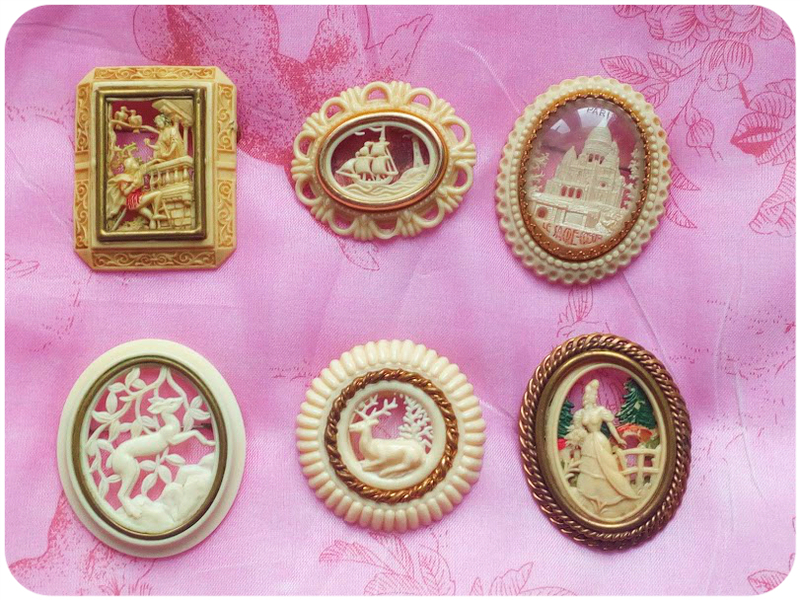 I loved the berry one the best and then I saw the carved celluloid one- how beautiful! I've yet to come across one of these but I'll be keeping a very sharp eye out now! I love the 3D effect they have. Hope your week has been going well and that you're keeping warm. Your outfit is so perfectly colourful too - I like seeing how it all came together, even if it wasn't what you'd planned to wear at first! That's a fab suit Ann. The pink opaques are perfect to brighten a dark January day, as for pink frost! Wow. 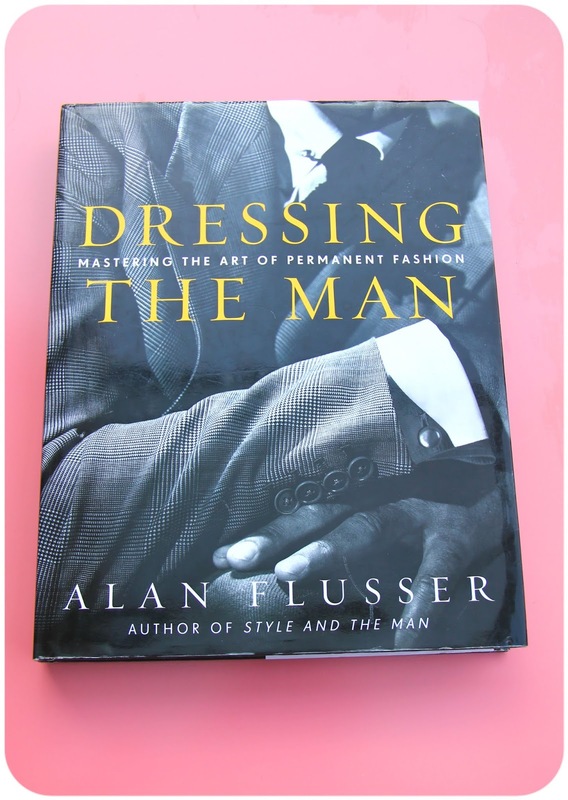 I’m going to have to find a copy of that book for Philip, it looks good and so do you Ann in that fabulous velvet number. 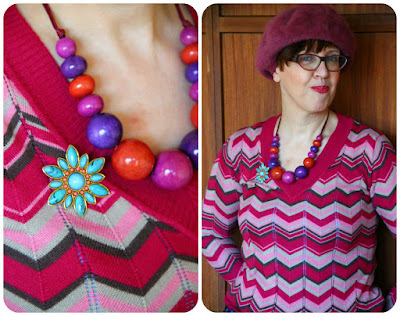 I love the way you play with shades of pink and blue in this post, Ann! And the skirt+jacket set looks like a richly textured coat which is just so lovely! 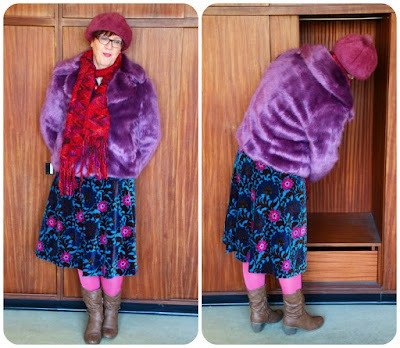 You have quite a collection of vintage knits and outerwear, and the purple fur coat is a great find! 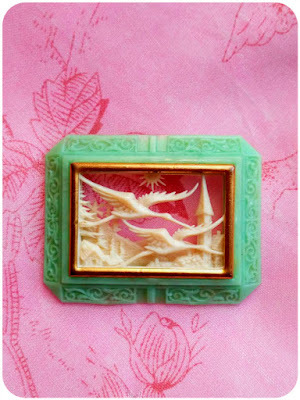 I adore the brooches you show here, and the green frame is reminiscent of jade which is so popular in Chinese culture (as is this type of carving). Have a wonderful weekend, dear friend, and join us for our new MM! Lots of love! 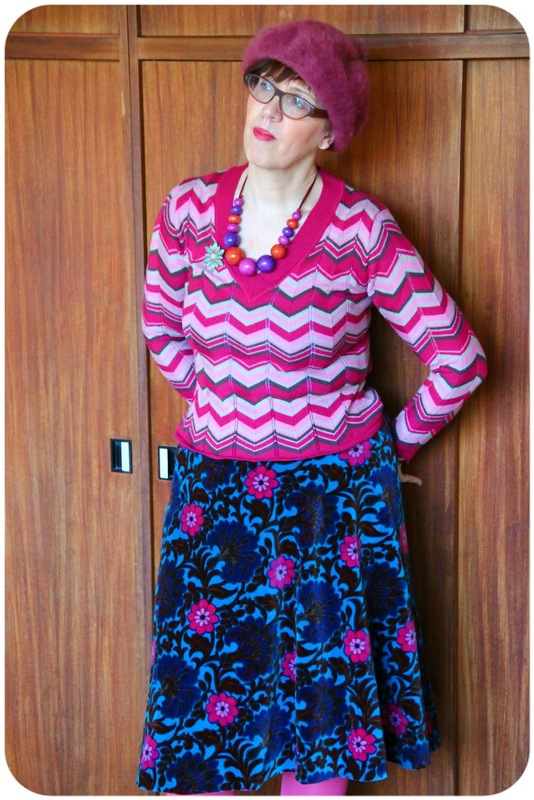 I love a zigzag print, and those colours are fantastic in these grey cold boring days. I adore the dragonfly brooch, it's by far my favourite. the green framed brooch is so beautiful! WOUUU I'm totally in love with your velvet suit, its colorful print and fabulous velvetness!! 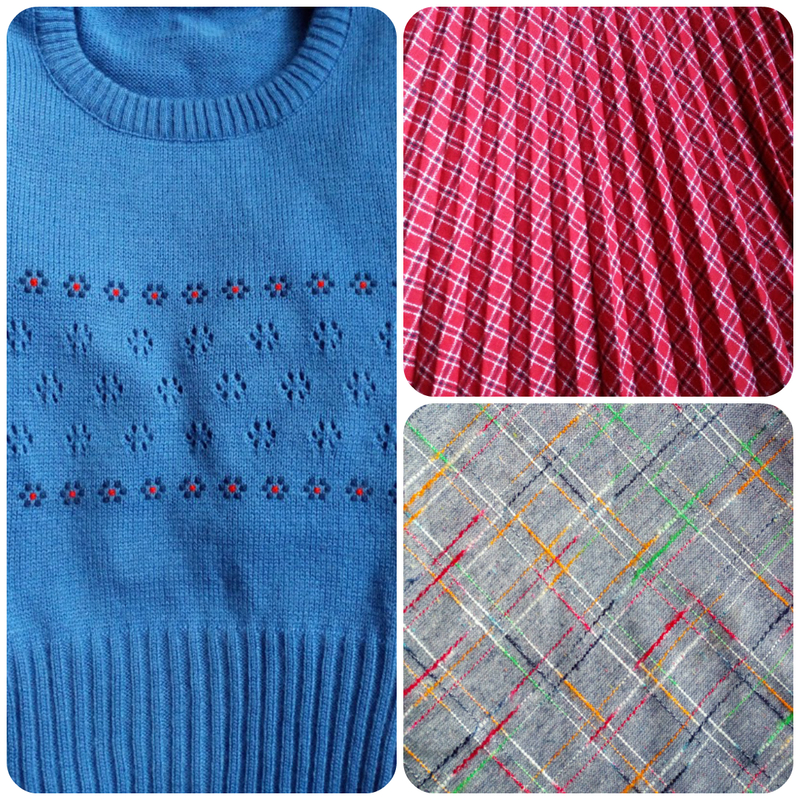 sorry that you couldn't wear it in this cold weather!. Also love the faux fur coat, so cute!, and the pink sweater and Pink Tights!! gorgeous! 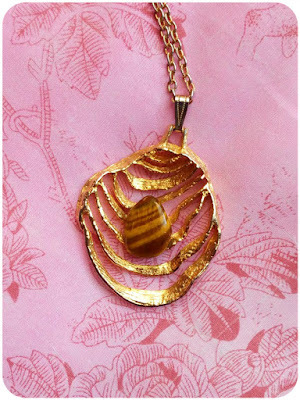 And such fab purchases!, the book and the brooches look fantastic! my favourite is also the berries one! 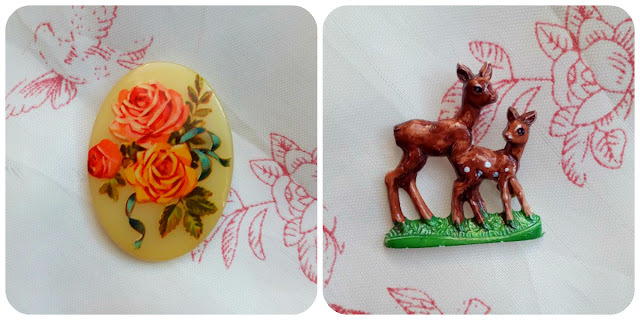 and your celluloid brooches collection is increasingly fabulous! 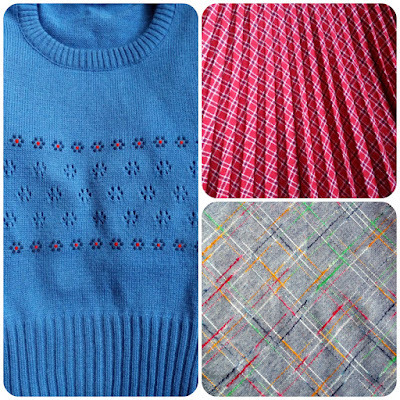 OMG, so much to love and covet in this post. That velvet suit! 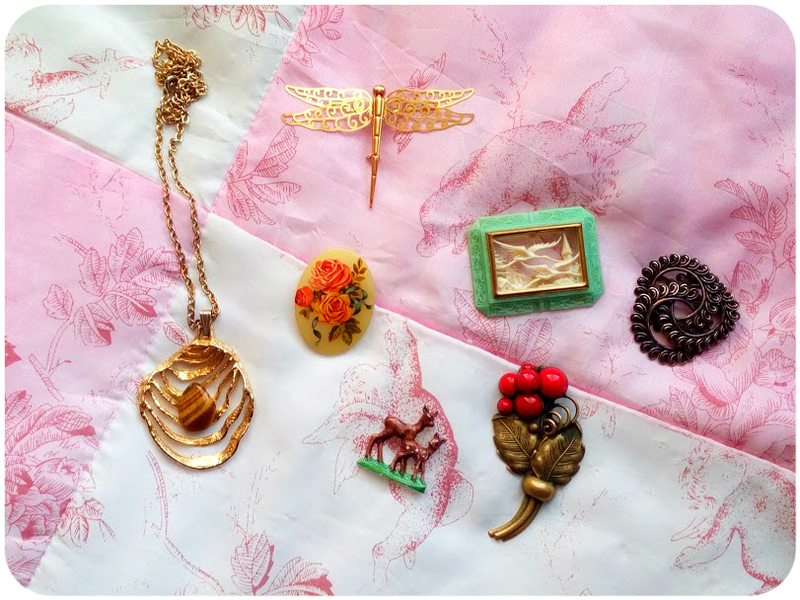 Those celluloid brooches OMG! The beehives!! 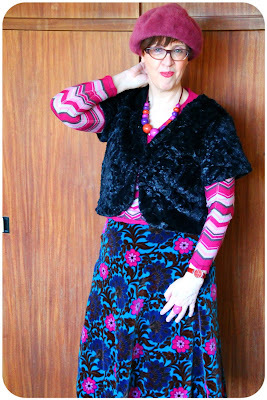 The Bonnie and Clyde vibe of the zigzag jumper with the beret and the velvet skirt! !